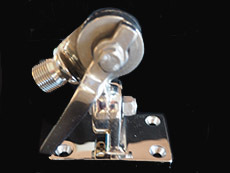 D.Lilly &Company is a manufacturer of all Marine Antenna mounts since 1968. We provide Stainless Steel antenna mounts, Antenna accessories, Reinforced Nylon antenna mounts, Commercial Antenna mounts, VHF GPS TV Cellular Mounts and all other varieties of boat antenna mounts including commercial single sideband antenna mounts for deck and rail mounts. D. Lilly & Company supplies worldwide marine dealers including marine dealers on Long Island (Suffolk and Nassau County) New York and throughout the United States. All Marine dealers are always welcome please call. For Retail please contact your local marine dealer.